The models’ holdings alternate between ETF (SPY) and ETF (IEF), being proxies for investments during up- and down stock market periods, repectively. We provide three variants of the iM-SuperTimer that are triggered by the iM-SMC, an indication of the stock market confidence level, which we calculate on a weekly cycle. (See Appendix 1 or previous update.) The iM-1wk-SuperTimer is a fast response timer whereas for the iM-1mo-SuperTimer, and iM-3mo-SuperTimer, trade only in the relevant first week of the month. This model reconstitutes weekly and has a specified minimum 5 weeks holding period of a position. This facilitates a holding period greater than 30 days, which in many instances is the required holding period of mutual funds. All trades are assumed on the first trading day of the week. Simulated past performance, maximum drawdown, and number of trades, as well as current holding are shown in Figure-1. For the period 1/3/2000 to 3/18/2019 the model would have produced an annualized return of 19.9% with a max drawdown of about -10%. A buy-and-hold strategy of SPY had an annualized return of only 5.4% with a maximum drawdown of -55% over the same period. Since the iM-SMC level is available on Sundays, trading is assumed to occur on the first trading day of the week thereafter, usually a Monday. Trading should not be delayed by more than two days as the model’s annualized return diminishes then. This model reconstitutes monthly. All trades are assumed on the first trading day of the week in the first week of the month. This should be more convenient to follow than a model which reconstitutes every four weeks. Simulated past performance, maximum drawdown, and number of trades, as well as current holding are shown in Figure-2. For the period 1/3/2000 to 3/18/2019 the model would have produced an annualized return of 16.7% with a max drawdown of about -19%. A buy-and-hold strategy of SPY had an annualized return of only 5.4% with a maximum drawdown of -55% over the same period. The return is lower than for the model reconstituted weekly, but trading effort is reduced by approximately half from that of the 1-week model. Trading can be delayed as the model’s annualized return is not too much affected by trading a few days late from the first trading day of the week. This model reconstitutes every three month. All trades are assumed on the first trading day of the week in the first week of the month. This model may be of interest to participants in retirement savings plans and education savings plans where the number of asset allocation switches per year is limited. This model shows only 16 switch trades over the 19 year backtest period, with a maximum of two switches in a calendar year. Simulated past performance, maximum drawdown, and number of trades, as well as current holding are shown in Figure-3. For the period 1/3/2000 to 3/18/2019 the model would have produced an annualized return of 14.1% with a max drawdown of about -19%. A buy-and-hold strategy of SPY had an annualized return of only 5.4% with a maximum drawdown of -55% over the same period. The return is lower than for the models reconstituted weekly and every month, but trading effort is only about one third of the 1-week model. It only produced 16 switch-trades during the 19-year backtest period. Trading can be delayed by up to 10 days as the model’s annualized return is hardly affected by trading a few days late from the first trading day of the week. Despite this low trading frequency the model’s initial Jan-2000 investment would have grown from $5,000 to about $63,000 in 2019, for a total return of $58,000. This is an impressive performance. A buy-and-hold investment of $5,000 in SPY or IEF would have only grown to about $13,800 for a total return of $8,800 over the same period. So, following the few signals from the iM-3mo-SuperTimer one would have added more than 6-times as much to one’s savings as one would have had from holding either SPY or IEF. 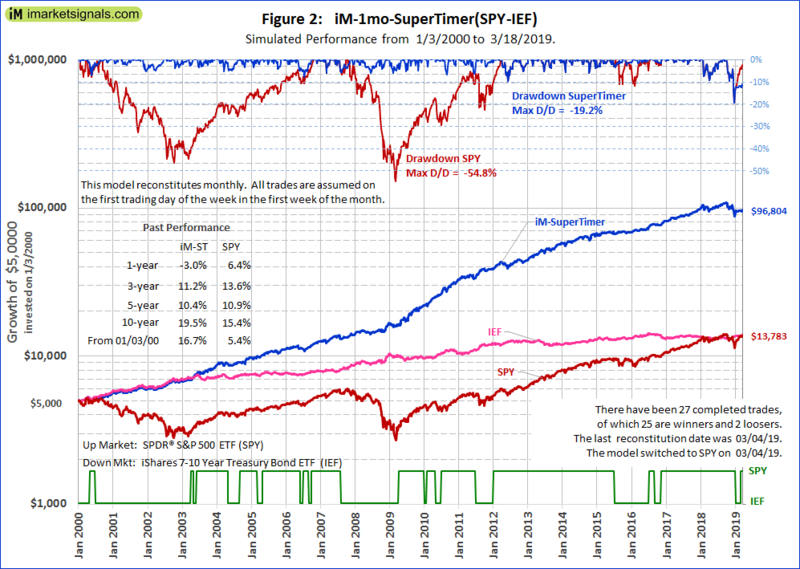 The backtests suggest that the iM-SuperTimer based on the Stock Market Confidence Level Strategy could provide useful trading signals for investors and savers. At iMarketSignals we have provided weekly updates of the iM-Stock Market Confidence Level for longer than two year now. We are currently providing updates for the weekly reconstituted iM-SuperTimer model. We will also provide weekly updates for the iM-SuperTimer models which are reconstituted monthly and every three months. Figures 1, 2, and 3 will be updated monthly. The performance data shown represent past performance, which is not a guarantee of future results. Investment returns and portfolio value will fluctuate, and future signals from these models may not be as efficient as they were in the past. The stock market confidence level is recalculated on a weekly cycle from the stock holding percentages and importance factors of 15 models rounded to the lowest number that is divisible by 5. Didn’t super timer ( old-1 week) buy spy on 3/18/19? The new 1wk SuperTimer holds a position for a min period of 5 weeks to avoid weekly back and forth trading. This eliminates the annoying short holding periods which a weekly timer can have and also improves returns. If you want to trade according to the old timer on a weekly basis, there is nothing stopping you from following the weekly iM-Stock Market Confidence Level which signals up-market conditions when iM-SMC > 50%. Can you explain the 5 week feature a little more. Last week the 1 week timer went to SPY. Today it is shown as in IEF. So the model will hold SPY for 4 more weeks and in addition tomorrow go into IEF for a minimum of 5 weeks? No, it does not work the way you say. If you ignore the 5-week holding period then you just follow the weekly iM-SMC level, currently at 75%, indicating up-market conditions, and you would be in SPY. The new 1wk-SuperTimer is reconstituted weekly, but holds a position for at least 5 weeks. It switched to IEF on 2/25/2019 and the 5 week holding period is not up yet. So, it is still in IEF. If by April-1 the iM-SMC level is still higher than 50% it will switch to SPY then. I am having difficulty understanding all this. We now have 3 Supertimers whereas before there was one. The new one week Supertimer is now in IEF whereas before it was in SPY…why? Is this because of the (new?) 5 week holding rule? Gold subscription members can follow any of the three models, depending on their needs. Yes, the new 1-wk SuperTimer is in IEF because it switched to it on 2/25/2019 and the 5 week holding period is not up yet. Please also see my other comment above. thank you for another great modification of the model. Can you please provide the trade dates for the 1-week (5 weeks holding) model? The reason you reconstitute weekly is for those that want to trade weekly? But, for those that follow the recommended holding period, what happens in weeks 2-4 is noise and the next trade relies on what the IM SMC level is in week 5? For example next Monday we hold IEF. During next 2-4 weeks the IM-SMC stays above 50% but, in week 5 IM-SMC comes in less than 50%. The model would call for staying in IEF, correct? The iM-SMC level>50% (or the old iM-SuperTimer) reconstitutes weekly, but holds a position for min period of 1 week. The new 1-wk SuperTimer reconstitutes weekly, but holds a position for min 5 weeks. You are correct in your assessment that the new 1-wk SuperTimer does not respond to changes in the iM-SMC level during the 5-week min holding period after a position change. The link in the grid on the weekly updates page points to “Seasonal Switching Strategy” (your modified strategy that uses cyclicals and defensives) instead of “Seasonal Strategy” that you use on this page. I’m assuming you want the one on this page. “Seasonal Strategy” is the correct link. Below a summary of the performances of the iM-SMC level>50% (or the old iM-SuperTimer) compared to the three new models. The iM-SMC level>50, which reconstitutes weekly with no hold period has a third more trades than the iM-1wk-SuperTrader and also under performs it. Note the 1wk model outperforms SPY in the upmarket period of the last 10 years, and the 1mo model equals it. Can you give us a list of the dates 45 trades for the weekly 5 model? Can we have the list of trade for iM-1wk-SuperTimer (SPY-IEF)? thank you! Like this strategy. Can the 1 week model(s) be run using SH (1x inverse SPY) instead of IEF please? Are buys made at the open or close on Monday?? Trade is always on close. Looks interesting. Let the community know if you find something that is easy to implement. Man – I agree, but think it will be slightly better (similar to the SPY-IEF results compared 1 wk to 5 wk). I like your idea re: gold. Taking it a step further, perhaps the “out of market asset”, be it IEF or gold, can be determined by a separate indicator, perhaps based on inflation level or trend. Looking back at 2009, a gold trend indicator could have been extremely lucrative as the out of market asset in the uptrend. Also, as we don’t know what the next crash holds, gold could be the safe asset, who knows? I agree. We know that the iM Gold Timer(rev1) uses Federal Funds Rate, 10-year Treasury Note yield, S&P500 Estimated Earnings Yield, and Gold Price. And it’s either in gold or it’s not. So it could be used as an on-off switch to either be in gold or in bonds. Or all bonds vs 1/2 gold 1/2 bonds given gold is a lot more volatile. Another useful on-off switch could be the BVR model that is used in the SSO-Bond timer. You could use that to choose your bond ETF — IEF or TLT. Many thanks. 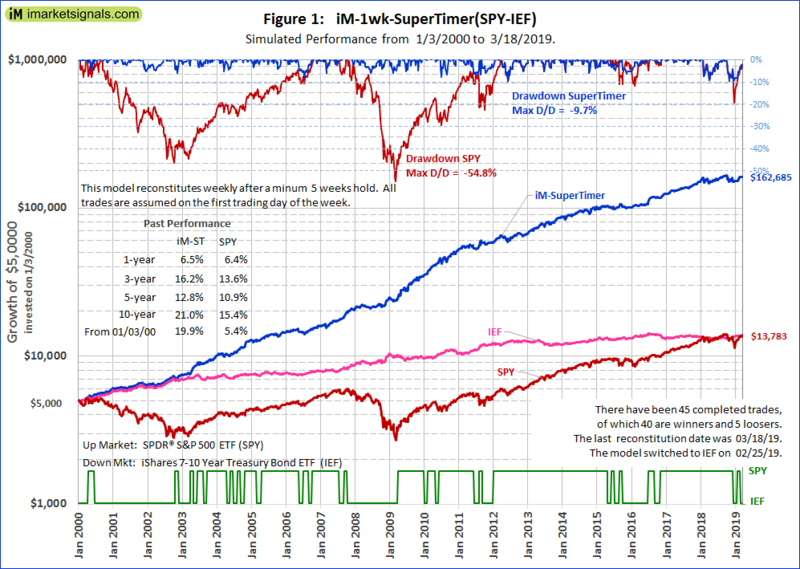 Could the 1wk-SuperTimer(SPY-SH) backtest be run using the ‘NO 5-week hold’ condition please? 1, The 1-wk SuperTimer is reconstituted weekly. That is what the 1-wk means. i.e it checks the iM-SMC Level every week. 2, When the 1-wk SuperTimer generates a signal for a position change it holds the position for at least 5 weeks, but it looks at the iM-SMC Level every week, and not every 5 weeks. The 1-mo and 3-mo models check the iM-SMC Level every 1- or 3 months only, meaning they are reconstituted every 1- or 3 months, respectively. 3, We will not be tracking the old model which had a min holding period of 1 week, but if you want to follow it just check the iM-SMC Level every week and trade accordingly. What is the point of checking/ reconstituting the iM-SMC level every week if the hold period is a minimum of 5 weeks? It does not appear from your description that any of the iM-SMC data from weeks 1-4 are used in the calculation to exit/enter a position, just the data from thee iM-SMC level of week 5. Am I misunderstanding you? You have to check the iM-SMC level every week. Assume after the 5-week hold, week-6 is still a hold, but week-7 is a switch signal. If you didn’t check every week you would not know this. You are correct that during the 5-week hold period the check is ineffective, i.e. the model does not respond to it. If one were to implement a ‘pure’ one month model, I’m assuming that the results would still be strong if one were to simply on the first day of the each month, simply use whatever the current iM Super Timer would suggest, regardless of the day of the week? It seems pretty clear given what all the other iterations have produced, but wondering if I’m missing something. The ‘pure’ one month model is the iM-1mo-SuperTimer model. This model only looks at the iM-SMC level on the first trading day of the week in the first week of the month, as per model description. Right. In general that would trade every month plus or minus five days or so the way I am reading it. I trade on the first trading day of the month in my retirement plan. I was thinking that if I followed the current state of the Super Timer, that I wouldn’t lose much (if anything) in performance compared to your timing. Our models can only provide signals on a weekly basis, and trade on Mondays, if it is not a Holiday. Otherwise on Tuesday. Do I recall correctly that substituting RSP, the equal weight S&P Index, for SPY results in better returns than just using SPY when the timing signal says to be long the US market? What’s the performance difference? I get that it’s a lot easier to just use the well know S&P 500 ETF or mutual fund (equal weight funds access are a problem with many retirement accounts) rather than RSP, since most investors are more comfortable with that index and it is more easily compared. Is there a downside, i.e., volatility, rather than just being relatively less well know, and in some cases less available as an investment option? The three SuperTimer models use SPY and IEF to signal upmarket and downmarket conditions, respectively. One can substitute combination models that hold more equity than fixed income for upmarket, and the reverse for downmarket conditions. We are not looking for highest returns, otherwise one could use the double leveraged ETFs SSO and UST for huge simulated returns. I like these strategies especially for 529 Education Accounts where you can only have 2 switches/year. Can one switch out the SPY and IEF for Total Stock Market Indexes and Total Bond Market Indexes? Some retirement plans and 529 accounts don’t offer SPY and IEF like intermediate bond funds, some do. For the simulation using Total Stock Market Index ETF (VTI) and Total Bond Market Index ETF (BND) the total return is about 15% lower than for the SPY and IEF model. For the 3-mo SuperTimer the terminal value of $5,000 growth from Jan-2000 to Apr-2019 with VTI and BND is $57,000 instead of $64,000 with a max D/D of -20%. CAGR=13.4% instead of 14.2% for the SPY and IEF model. Many thanks for the simulation and re-running the numbers. Have you looked at how a QQQ/IEF model would perform?